Should people eat dogs? Arguments for eating pigs and cows are weak. We usually just try not to think about it. I live around the corner from a gourmet grocery store that has, for the past several weeks, displayed three-foot-long sides of cured beef in the display window. 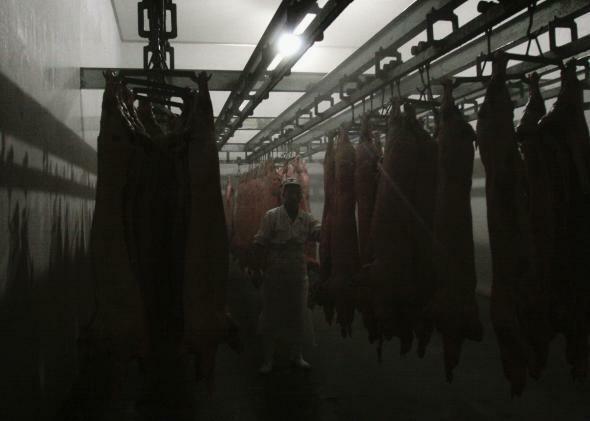 The meat looks like what hangs from those big metal hooks in a slaughterhouse after people saw the cow in half. Though I walk by every day, I always feel jarred by the sight. The meat recalls the animal it came from in a way that I’ve grown unaccustomed to seeing in American grocery stores. Does this grisly display appeal to anyone? Other passersby go about their business unfazed, lugging their grocery bags and talking on their smart phones. Revulsion, it seems, is in the eye of the beholder. Last month, John D. Sutter wrote a piece for CNN in favor of eating dogs. It forced readers to look more closely at what we consider repulsive. We already kill 1.2 million dogs per year in America’s animal shelters, Sutter pointed out. Dogs’ intelligence and sociability are not enough to distinguish the species from pigs, which are also highly social and intelligent. Sutter makes it clear that if you think that Fido should be under the table rather than on it, then Wilbur’s spot next to the potatoes is arbitrary at best. But the piece wasn’t so much a serious suggestion as a modern A Modest Proposal, meant to spur our reexamination of a contentious topic. Despite being a dog lover, I welcomed Sutter’s proposal as a much needed thought experiment. We should have to think twice about something that involves not just our health and environment but also the 3.7 billion land animals in the United States raised and slaughtered for food—not to mention the wellbeing and safety of the people who do the unseemly work for us. There is something automatic about the unthinking way we approach our food—something reminiscent of Descartes’ description of animals as living machines. The dog-eating argument stirred up a painful memory for me. When I was in college, my parents went on vacation and trusted me with caring for our beloved dog Mickey until I could join them at the end of the week. On the morning that I was supposed to catch a plane to meet them, I let Mickey out in the backyard. I went upstairs for a few minutes to continue packing. When I looked out the window to check on him, Mickey’s lifeless body was floating in my parents’ swimming pool. After leaving Mickey’s body at the vet, I flew to meet my parents. They convinced me that being alone after such a traumatic experience was not a good idea. I sobbed in a stranger’s arms during the entire flight, and she shared stories of her own beloved Chihuahua’s death. When my parents picked me up at the airport, it was lunchtime, and we immediately went to a barbeque place. We were all drained from crying, and we were hungry. But waiting in line, eyeing the ribs dripping with sauce, I felt revulsion. I ordered macaroni. As I looked at the slabs of meat on others’ plates and smelled the fleshy saltiness in the air, I could think of nothing but the limp weight of Mickey’s body as I lifted him out of the pool. The experience had been, for lack of a better term, so bodily. Suddenly, I saw meat, this thing I had eaten most days for my entire life, with new eyes. Meat was the product of violence, dead flesh that had been manipulated into what was supposed to be a more pleasing form. I ate meat again after Mickey died. I went back to college and largely subsisted on turkey meatballs, which I pressed into a panini in my roommate’s panini press. Around that time, The New York Times challenged readers to write an essay in favor of meat eating. I awaited the contest results with anticipation. I was, after all, looking for an excuse to eat meat—something that could appease my conscience. Isn’t it meat eating that creates hopelessly artificial divisions? Don’t meat eaters divide the world into the spared and unspared, but more arbitrarily? Dogs are spared in America. Pigs are not. Horses in America are spared; in Europe, they are not. Rabbit? A gray area. In his essay, Bost quoted a Wislawa Szymborska poem which says that nothing is more “animal-like” than having a clear conscience. Bost’s use of the poem stank of laziness. It’s human not to have a clear conscience, he seems to argue, and therefore we shouldn’t be so troubled that we are troubled about eating meat. As we learn more about animal consciousness, there has never been a better time to reexamine the animal capacity for suffering and our relation to it. In Wild Connection, Jennifer Verdolin, an animal behaviorist, writes about geese who display mourning behaviors when their partners die: They refuse food, call loudly, and stand over their partners’ dead bodies, puffing their feathers, and sometimes dying themselves. In Animal Madness (which I reviewed for Slate), Laurel Braitman recounts numerous incidents of animals exhibiting behaviors very similar to the ones we exhibit after a trauma. The days of Descartes’ automata seem, in many ways, over. The true test of our humanity requires a wider imagination. Animals remain in many ways just beyond our full understanding. We make educated guesses about the meaning of this or that behavior, but there is a heavy muteness between us. We test our compassion when we look at their foreign bodies and consider how to treat them. Sutter’s thought experiment about eating dogs was a little jolt of energy for our imaginations.